Interest in smartwatches has soared in recent months, even as it has stalled for smart glasses. Credit, or blame, the coming Apple Watch. That survey underscores the promise -- and perils -- of smartwatches for corporations and their IT shops, which will have to accommodate workers using the devices for work email and other tasks. Some IT admins see smartwatches as a passing fad, but others regard them as an evolving computing platform worthy of attention. Much of the uptick in interest in smartwatches coincided with Apple's announcement in September that it would begin selling the Apple Watch in early 2015. Apple emphasized styling, and other manufacturers have taken up that mantra, including Intel with its $495 gemstone-embedded MICA, an intelligent bracelet that includes two years of 3G wireless data service from AT&T for free. When Futuresource asked 4,000 consumers in the U.S., U.K., France and Germany in May whether they intend to buy wearable tech, 4% expressed interest in a smartwatch. That number more than doubled to 9% in a follow-up survey of 4,266 consumers in October. As for iPhone owners asked in May about their wearable tech buying plans, 6% wanted a smartwatch. 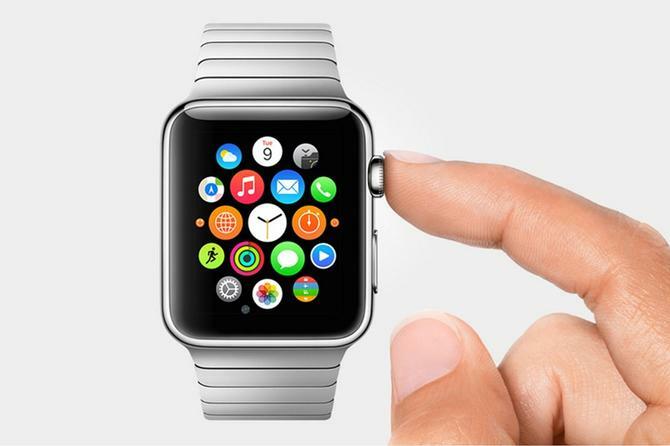 That number almost tripled to 17% in October -- a month after the Apple Watch announcement. "As Apple customers are typically some of the earliest adopters of new technologies, their increasing engagement with the smartwatch category is a strong positive for the Apple Watch release in early 2015," FutureSource Associate Director of Marketing Andy Watson said in an email. Apple's innovation of the iPhone in 2007 and other devices has given the company a reputation for carving out new technology beachfronts. FutureSource has predicted 51 million wearable devices of all types will be sold this year, with 74 million sold in 2015. Even though that number is rising, it remains a small portion of the 1 billion-plus smartphones that will be sold in 2014. Of those 51 million wearables sold in 2014, nearly 7 million will be smartwatches or related devices; that number is expected to rise to 20 million in 2015, Futuresource predicted. Critics have dinged smart glasses like Google Glass and other wearables for looking awkward. As a result, smart wearables makers have put a premium on styling to lure buyers. As one recent example, Intel and AT&T announced that the MICA intelligent bracelet will go on sale in December. The 3G wireless connection it offers means it doesn't need to be tethered to a mobile device to receive wireless alerts and texts. MICA, which stands for My Intelligent Communication Accessory, was designed by fashion company Opening Ceremony and engineered by Intel. It will be sold exclusively by Opening Ceremony and Barney's in the U.S.
MICA runs on Linux, and features a 1.6-in. curved touchscreen display made of rugged sapphire. Opening Ceremony piled on the glam. The wristband comes with an 18K gold coating and comes in two styles: one with black water snake skin, pearls from China and lapis stones from Madagascar, the other featuring white water snake skin, tiger's eye from South Africa and obsidian from Russia. While MICA is not voice-capable, it will provide access to text messages and notifications and will display Google Calendar and Facebook events. Intelligent reminders powered by TomTom and Intel will use location information to dynamically estimate how long it will take to get to an appointment. Yelp local search is also enabled. MICA is chargable with a micro-USB cable and should provide two days of battery life on a charge. Remote access and locking are possible. The device's combination of styling and functionality show where at least one segment of the wireless devices category is headed. "Intel is addressing a primary issue that has held back wearable acceptance, namely the style issue that has plagued the current crop of wearables from companies like Samsung, LG, and Pebble," said Patrick Moorhead, an analyst at Moor Insights & Strategy. "Most of the smartwatches in the market today are geeky and unattractive, but Intel's MICA is more like electronic jewelry and comes from a trusted fashion brand, Opening Ceremony, and will be sold through Barney's," he said. While MICA's $495 price seems high, the inclusion of a two-year wireless 3G connection and a variety of intelligent functions coupled with high-fashion styling could lure buyers used to other smartwatches that sell for $350 sans 3G wireless capability. By comparison, the most recent smartwatch from Samsung, the Gear S, features a 2-in. curved display and voice calling with 4G, Wi-Fi and Bluetooth wireless data. T-Mobile recently began offering it for zero down and $350 over 24 months. That price doesn't include T-Mobile's $15-a-month wearable rate plan. The Gear S is Samsung's sixth smartwatch and runs on the Tizen OS. One disadvantage is that it needs to be paired with Samsung Galaxy smartphones for many of its apps and functions to operate. The Gear app store is also fairly limited. Compared with the MICA, the Gear S is larger, but its curved screen and other details show Samsung is focused on improved styling. Nonetheless, CNET reviewer Scott Stein dubbed it "the phablet of watch displays." Given the various shortcomings of the latest smartwatches and other wearables, there's little urgency yet on the part of IT executives to understand their impact on the enterprise. Still, smartwatches, wristbands and bracelets are already being worn -- and used -- in some workplaces. "Some people are wearing smartwatches here and that's yet another tech space that will evolve," Eric Reed, CTO at GE Capital, said in a recent interview. Reed oversees the mobile computing and related needs of 50,000 GE workers and helps guide computing decisions affecting millions of GE customers. His team conducts field tests on different new smartphones, tablets and other devices. "Most smartwatches require a connection to a phone and they are an interesting tech space, but there's not a lot of screen real estate on many of them" to perform involved work tasks, Reed said. "I'm not sure how much smartwatches are a consumer thing or an enterprise thing yet. It's a little early to say."